The Bala shark, also known as the tricolor shark, comes from Asia – specifically Sumatra, Thailand, Borneo and Malaysia. The bala shark is an active and peaceful fish that swims in middle water layers. Many people buy them as small “cute” sharks. They are not sharks at all – actually they are related to carp and minnows. They also due not stay small – they will grow large and will need a large tank to be properly cared for. In their native territories they are considered threatened. Maximum Size: The maximum length is 14.0 inches. Minimum Tank Size: 50 gallons or larger tank is appropriate. Life span: up to 6 years or more depending on care. Care Level: The Bala shark is a relatively easy fish to maintain. On a scale of 1 –10, (10 being easy) it would rate an “8”. Tank Conditions: Temperature 75 - 82°F; pH: 5.5 – 8.5. 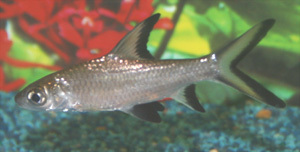 Color: Bala shark has a slightly downfacing mouth with no Barbels. It is a very slender fish with a general convex appearance. 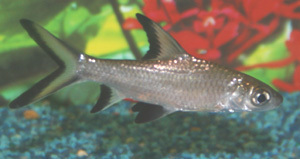 The Dorsal fin is triangular in shape and is the reason for its' common name. Almost all the fins are edged with a wide Black band, with the front areas being bright Yellow or Orange in color. The Pectoral fins are transparent. The sides are silver with a slight Yellow sheen. The Back is Brown and the Belly area White. Temperament: The bala shark is an active and peaceful fish. It inhabits the middle layer of water and will swim throughout the tank. They will generally not bother other fish, however, guppies, cardinal tetras etc should not be kept with these fish. Diet: Omnivore - It has no specific feeding requirements and will accept all flake food as well as supplemental live foods. Use a good flake food as the basic diet. Some good supplements include bloodworms, tubifex worms, Tetra bits, and frozen brine shrimp. Habitat: The Tank should be large with live plants and also lots of swimming areas, the Bala is a very active fish which will cover all areas of the tank and will go over the substrate picking up pieces of food that were missed by others.